Wildwood Church of God in Ashland, Kentucky, actively integrates technology in almost all parts of their ministry. Wildwood utilizes a smartphone app, which has been active for six years, and is available on all phone operating systems, as well as tablets. This app allows people to register for events, view the church’s calendar, give online, read and submit prayer requests, access the Sunday morning service archives, and view the services live, as well as provide daily Bible reading and listening plans. Wildwood also uses Facebook and Twitter to share important updates for general news, as well as children’s and youth ministries, and urgent prayer requests. People can subscribe to these updates through either Twitter or text messaging. Taking advantage of even more technology, Wildwood Church recently announced the institution of a twenty-four-hour Roku channel. Roku provides audio, video, and other media content through such channels, and the electronic receiving device retrieves the data from Roku via the Internet. Wildwood’s channel will be available on the church’s website, the church’s smartphone app, and also on the Roku streaming video platform. 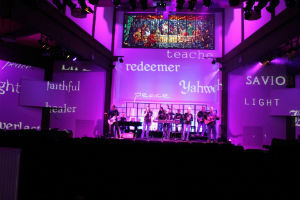 Wildwood has provided delayed broadcast of their services for several years, but did not provide the worship section of the service. This new Roku channel will provide archives of past services, including worship, sermons, and live feeds of Sunday morning services. The pastor of student ministries, Bob Hawker, traveled to New York City to attend the Streaming Media East Conference to learn more about Roku channels and the specifications needed in order to publish their channel. They announced the change by recording videos around New York City and then posting them to the church’s Facebook page, as well as showing the videos on Sunday morning. Shortly after announcing the Roku channel, Wildwood Church had people from twenty-six states and four countries watching their channel! Pastor Bob Hunt says that even though they use a lot of technology at Wildwood Church, they never want it to overshadow the message, but instead to enhance it. They believe that the message they are telling never changes, but they need to constantly find new ways to tell it. At Wildwood Church, they know it’s not the electronics or technology that is the message, but rather a vehicle for the greatest message on earth. Katy Hagerman is a communication intern for Church of God Ministries from Lapel, Indiana. She is currently studying business management and event planning at Anderson University. Learn more about the Church of God at www.JesusIsTheSubject.org. This entry was posted in All Church of God, Southeast and tagged Ashland, Bob Hunt, channel, Katy Hagerman, Kentucky, media, Roku, smartphone, TV, Wildwood, worship. Bookmark the permalink.